An interesting area that has recently hit the radar screen of many canyoneers, the Roost has been known and explored by bandits, ranchers and environmental extremists for years. The Roost has a sublime character. There's something cool about driving to the TOP, descending a narrow, squeeze-y slot, then popping out into a beautiful, pristine, remote backpacker-type canyon. Hiking downcanyon, the adventurer is then challenged by finding the obscure or obvious route back up to the top-lands. Repeat. The Roost has very clear distinctions between the plateau up top, the slotty canyons, and the wide canyons at the bottom. Half the struggle on many adventures is finding the escape route. 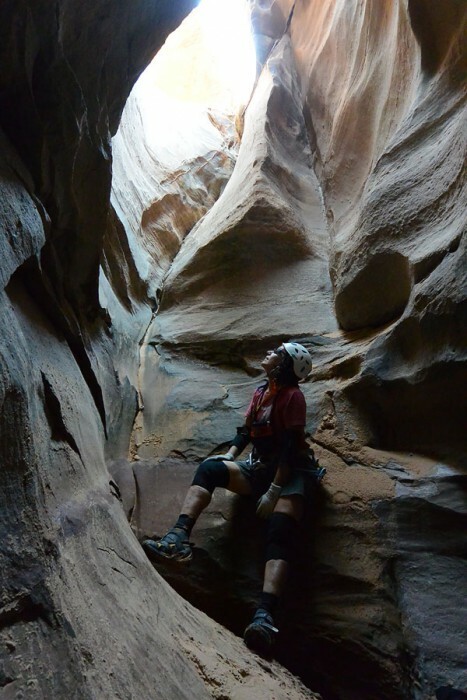 The Roost is one of Utah's more adult canyoneering areas. Like The Escalante, the adventures are spread out and, with a few exceptions such as the slots listed here, are rarely visited by humans. Self-reliance is the name of the game, which makes this a poor place for beginners to hone their skills. We have a few canyon descriptions here; a companion guide would be Steve Allen's Canyoneering 2, which has some info on the Roost. Please practice a NO-BOLT ETHIC when visiting the Roost. The area yields easily to natural-anchor techniques, though this may mean using deadmen, cairns, carefully-placed chockstones or other advanced techniques. Bring some webbing, and welcome the challenge of playing by natural-anchor rules. ALL the canyons in the area have been descended, so please figure out a natural-anchor solution as your predecessors did - it is possible! Fall and spring are the best times for the Roost. March through April in the spring, October through November in the fall. Unfortunately, these are also the times when the weather is least stable in Utah. Most of the Roost canyons hold a bit of water, but not a lot. Swimming and wading should be anticipated if there has been rain in the last month, and water can complicate anchor building in some locations. Let's emphasize this: In the spring and fall, the temps are pretty good for canyoneering with a wetsuit on, but the water can be cold and drain your energy quickly. I have heard of nasty swims through tight, slanted slots and under chockstones - so be mentally and physically prepared for significant difficulties. Fuggetaboutit. There ain't any. Fill up on gas in Green River or Hanksville, and carry everything you need, including water. The roads are surprisingly good, though some areas experience blowing soft sand from time to time that makes 4WD useful. Severe washboarding sometimes makes the roads unpleasant, and there are sharp rocks in places that are hard on tires, so be sure your spare is pumped up. Bad weather and dirt roads don't mix. Rain can make the roads impassable: plan accordingly. It's a long walk to Hanksville. Cell service can be obtained atop the ridge between the Green River and Dirty Devil River drainages. You're hooking into a tower over in Moab, so if you can see the lights of the Moab airport, you might get service.